We traveled north to Coventry, Richard, James and myself - it was Zedvember the 54th, Jeff's birthday and the annual bloggers meet. Canal zander were the target and I don't think we could have found worse conditions - the temperature has plummeted in the last couple of days, but my confidence was high after Friday's catch and as Jeff commented "who knows with zander?" We arrived into the rail station and after a quick Greggs pitstop for bacon rolls we hit the town water with lures. I had spotted a few jack pike here last year and didn't get to fish for them - there was no way I was walking past them this time. Richard was in on his first cast, what I thought was a zed but unfortunately the hook pulled. My first cast found an angry jack about a pound and a half - I'd waited a whole year to catch this one! We didn't have long but thought we'd bag up on jacks - but that was it, they didn't want to play. We thrashed the water to a foam for a couple of follows before jumping in a taxi and heading for the main event. We met the gang and after a quick chat we set out in search of zander - if they were up for it we had enough lines to find them. 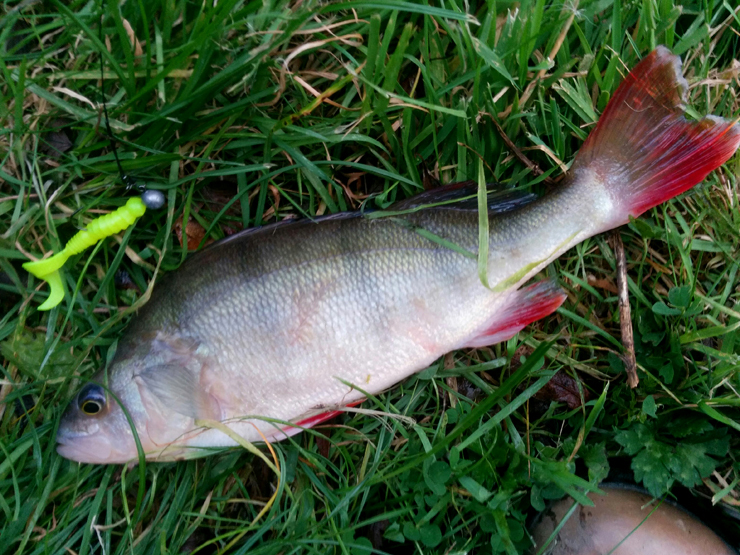 I float fished a roach slice for the zeds, and to hedge my bets fished a tiny green jig for perch on the other rod. To cut a long story short, and without spoiling anybody else's blog post it was tough going. Really tough! I did manage a perch on the jig and his shoal-mates bashed it around for the next couple of casts but that was it until it started getting dark. God knows how many casts I made with the jig but as the light faded something hit it and it pulled. I could tell from the fight it was a pike but had to wait for it to surface in the murky water to be sure, an esox and a good one with my tiny jig hanging from the scissors. We didn't really have the net for it but somehow James managed to get it in a net designed for grayling on the second attempt - thanks James. 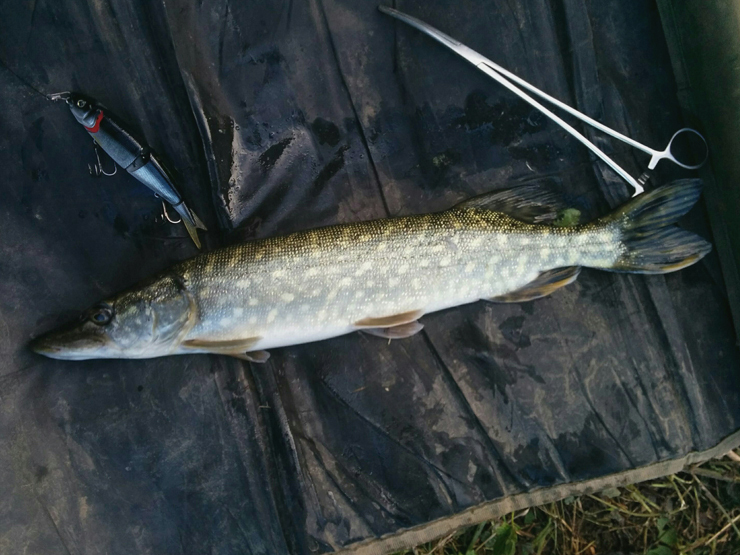 Not the zander I'd come for but a pike of exactly 10lb - delighted! You can't really tell from the photos but looking at it and holding it you could tell it had very recently eaten a crayfish - I wonder why it had gone for the little jig? It was dark and we headed for the pub. Pints and theories on why they hadn't fed (the temperature drop), rig ideas (I'm taking Jeff's lazy rig idea to Bury Hill), and of course past glories. And then things you see on the riverbank, not kingfishers and snakes, more people shagging or having a poo - we're a highbrow bunch! Just remains for me to thank Jeff and all of the gang - same time next year? I hope so. Or perhaps a bit earlier in the year? 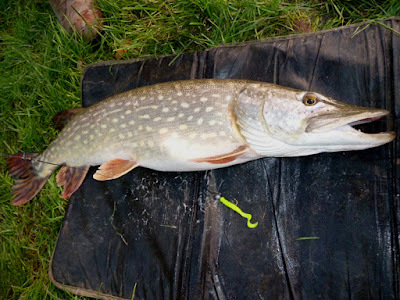 So why did that pike take my tiny jig? My brother text me the answer - elephants eat peanuts. It was tough as old boots, most of which you lot took out and dumped up the bushes for me along with every carrier bag in miles! Was great to see the fish come out in that very brief period around dusk. 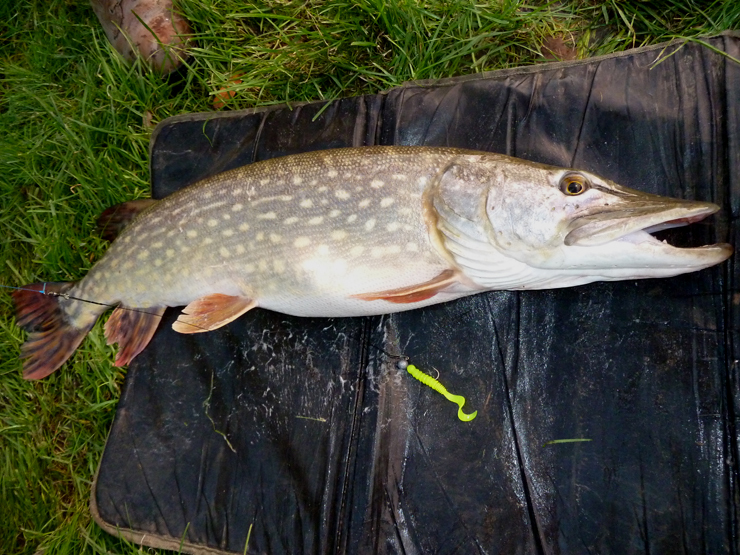 And great to see the double figure pike again after a noticeable absence from the scene the past years. I'll be down there soon enough to catch one myself. Glad we could help clean out the canal - can we have some warmer weather next time though? 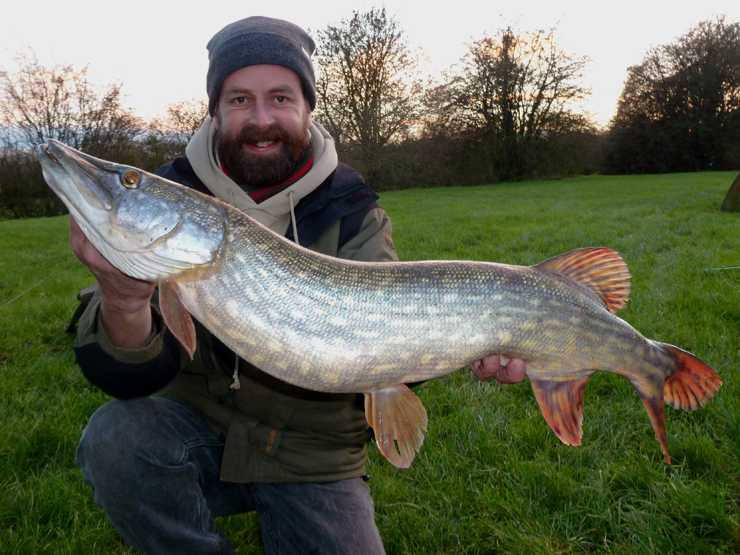 Tough trip, but every session that includes a pike is a good one and a double is even better - I'll look forward to your canal pike reports. Thanks for the invite - look forward to helping clean it out again next time. That Pike is one of the prettiest I've ever seen, the markings are so vivid, excellent stuff Mr Esox. I think your one from the CM is the prettiest one I've ever seen - but this one was a stunner on a very cold evening. Great photo - thanks James - I know who I'll be phoning for photos when I have a thirty in the net! Some lovely looking fish there Brian. Just a Zander short of the Coventry Canal predator grandslam! Cheers Russell. Only got myself to blame, how did I miss that take? But at least a couple came out - congratulations on the PB. Can't wait to try your zander photo trick - I've never seen a tip spread so quickly! They always seem to flare the gills wide and get those fins up naturally for me. Perch do not. So they will get the 'Hilton treatment' in future. Clever.